glad that another day is safely over. All of the earlier Skyhawk variants were basically day-only attack aircraft, and did not have the capability to operate at night or in bad weather. The next Skyhawk variant, the A4D-2N, was intended to give the aircraft an all-weather capability. The A4D-2N was equipped with an AN/APG-53A terrain-clearance radar in a 9-inch longer nose. In addition, it was provided with an angle of attack indicator system, a Low Altitude Bombing System (LABS), an autopilot, an all-attitude indicating gyro, and an improved Escapac 1A-1 low-level ejector seat. The windshield was provided with a wiper, and the cockpit layout was revised. The A4D-2N was initially powered by the 7000 lb.s.t J65-W-16A turbojet, but many later received the J65-W-20 with a takeoff rating of 8400 lb.s.t. The A4D-2N flew for the first time on August 21, 1958. It first became operational in February of 1960, with the Marine Corps squadron VMA-225. 638 A4D-2Ns were built. The A4D-2N was redesignated A-4C in September of 1962. At that time, the A4D-2N was still in production. During the production run of the A-4C, the production line was moved from the El Segundo plant to the Long Beach plant, with final assembly being done at a government-owned plant in Palmdale, California. This move was carried out in several stages during 1963. 100 A4D-2Ns that were being phased out of fleet squadron service were modified as A-4Ls to fulfill a requirement for the Navy and Marine Corps Reserves. As the A-4C and A-4L became surplus to Navy and Marine Corps requirements, several of them were delivered to foreign air forces--Argentina, Singapore, and Malaysia. Two A4D-2Ns (BuNos 148490 and 148483) were modified in 1961 for evaluation by the US Army as a ground support aircraft. Each of these planes was fitted with a drag chute stored in a canister underneath the rear fuselage and was fitted with low-pressure twin-wheel main undercarriage members that retracted into enlarged fairings underneath the wings. The two A4D-2Ns were evaluated by the Army at Fort Rucker, Alabama in competition with the Northrop N-156 and the Fiat G.91R. However, it was decided that the Army would not be permitted to operate fixed-wing attack aircraft, leaving responsibility for close air support of ground troops to the Air Force, the Navy, or the Marine Corps. As a result, none of the competitors was ordered by the Army, and the two A4D-2Ns were then converted back to standard configuration and delivered to the Navy. Engine: One Wright J65-W-16 turbojet, rated at 7700 lb.s.t. Performance: Maximum speed 657 mph at 4000 feet Cruising speed 496 mph. Stalling speed 140 mph. Combat ceiling 44,000 feet (clean), 40,000 feet with a single Mk.28 nuclear weapon. Initial climb rate 7100 feet per minute. An altitude of 20,000 feet could be attained in 4.5 minutes with a single Mk 28. Combat range 1140 miles (clean). Dimensions: Wingspan 27 feet 6 inches. Length 40 feet 1 inches, height 15 feet, Wing Area 260 square feet. Weights: 9146 pounds empty, 15,359 pounds combat weight 17,535 pounds gross, 22,500 pounds maximum. Armament: Two 20-mm cannon with 100 rpg. 3 underwing pylons. McDonnell Douglas Aircraft Since 1920, Vol 1, Rene J. Francillon, Naval Institute Press, 1988 American Combat Planes, 3rd Edition, Ray Wagner, Doubleday, 1982. United States Navy Aircraft Since 1911, GordonSwanborough and Peter M. Bowers, Naval Institute Press, 1990. 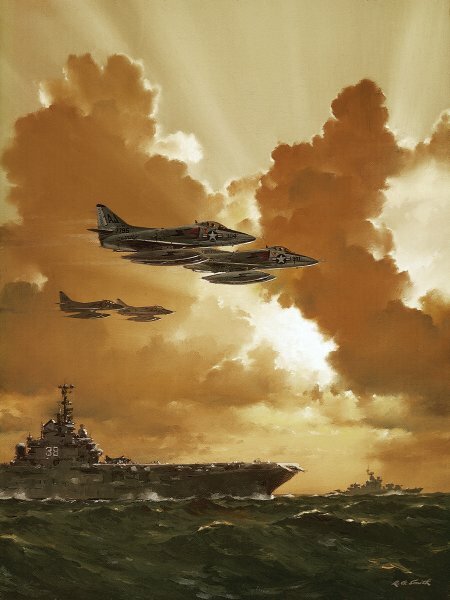 Douglas A-4 Skyhawk Variant Briefing: Part 1, Harry S. Gann, Wings of Fame, Vol 4, 1996. The Douglas A-4 Skyhawk, Harry Gann, Aircraft in Profile, Doubleday.